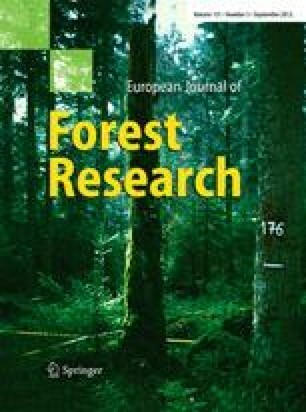 The effect of gap characteristics, including gap age, vegetation cover, and stage of regeneration, on water balance and drought stress was studied over a four-year period in natural and experimental gaps of various sizes in Dinaric silver fir--beech forest in Slovenia. A medium gap, two experimental clear-cut gaps, and a closed stand were selected in a traditional irregular shelterwood managed forest, and an irregular-shaped natural gap and part of the stand were selected in a semi-natural forest. Soil moisture, throughfall, and stemflow were measured in the gaps and stands, and incident precipitation was monitored in the open area. Evapotranspiration and drainage water fluxes were estimated using the water balance model BROOK90. To estimate drought stress, the ratio between simulated actual and potential evapotranspiration was used. Precipitation in the 2001 and 2003 growing seasons was considerably less than that in 2002 and 2004. The highest drainage fluxes were in the newly created clear-cut gaps with sparse ground vegetation cover, followed by the natural gap and medium gap, which had older and denser natural tree regeneration. On average, the clear-cut gap drainage fluxes were 18% (164 mm) higher than those in the forest stands. Evapotranspiration was lower in the natural gap and higher in the managed gap compared with the experimental clear-cut gaps. Water supply stress was greater for the forest stands than for the vegetation in the gaps. Drought stress was indicated to be lowest in the natural gap, which had patches of varying development phases and the highest water storage capacity of the soil and vegetation. The study was part of a Ph.D. study, NAT-MAN QLK-CT99-1349 5th EU FP and Program group Forest biology, ecology, and technology (0404-501), financed by the Ministry of Education, Science and Sport, Republic of Slovenia.